National Eat a Peach Day – Zero Equals Two! It’s August 22. On this date in 565 ev, Saint Columba reported seeing a monster in Loch Ness. In 1485 ev, Henry Tudor’s forces defeated English King Richard III during the Battle of Bosworth Field. In 1775 ev, English King George III declared the American colonies to be in open rebellion. In 1862 ev French composer Claude Debussy was born in Saint-Germain-en-Laye. Peaches are native to Northwest China, and China still produces over half of the world’s peaches. Its scientific name, persica, stems from the erroneous European belief that it was native to Persia, which is present day Iran. Peaches were brought to the Americas by the Spanish in the 16th century, possibly being planted in present day Georgia as early as 1571. By the early 17th century, they were being brought to the North American colonies from England. Founding Father Thomas Jefferson even had peaches growing at his estate, Monticello, but widespread commercial production of the fruit didn’t start until the 19th century. Currently in the United States, Georgia is known as the “Peach State”, although it follows California and South Carolina in total production of the fruit. 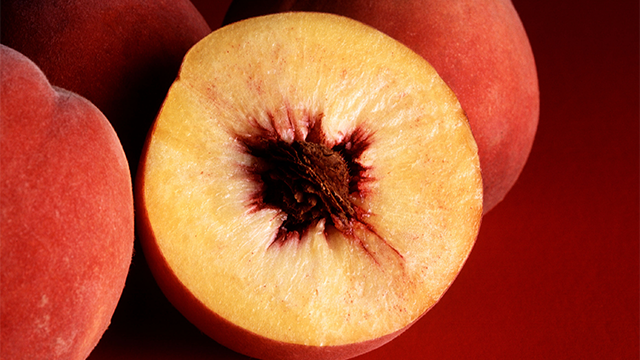 Contrary to popular belief, peaches and nectarines are the same species. Nectarines lack the fuzz that peaches have, and this is because they produce a recessive allele—or form of a gene—while peaches produce a dominant allele. Peaches are associated with Venus, Aphrodite, Freya, and Hathor. Some believe they convey longevity, protection, vitality, and love. The recipe below is a delicious way to celebrate Eat a Peach Day.